Choosing the date for your wedding is important in both Finnish and Chinese culture. In Finland we usually choose a Saturday during the three Summer months June, July and August. The weather should be nice and guests are usually free on a weekend. The date might also have a special meaning to the couple. It’s a lot more complicated in China. Of course you want to have your guests available on that date or perhaps choose an anniversary date for your wedding. Dates like 8th of August are also popular as number eight is a lucky number in China. There were lots of couples getting married back in 8.8.2008. 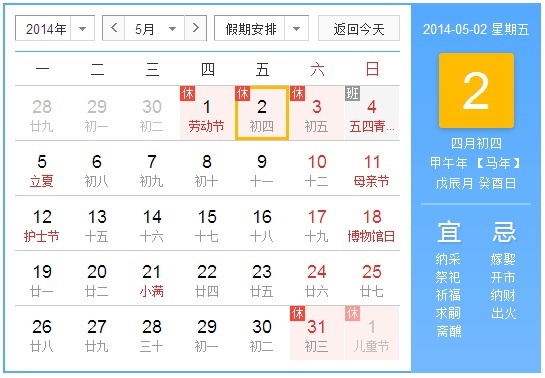 Then you have to check the lunar calendar that states which things or life events can be organized on a certain date. It also states which things you should avoid on that date. Sometimes it can be very hard to find an auspicious date for your wedding that fits your other needs as well. So how did we decide our wedding date or should I say wedding dates? First of all we are going to get our marriage certificates on Valentine’s Day. I think it’s a romantic day and perfect for getting married. It’s also easy for my groom to remember later on! Luckily it’s also an auspicious date to get married as you can see from the lunar calendar above. Under 宜 (suitable, appropriate) there is a word 嫁娶 which means to marry. Then comes our wedding reception a few months later on 2nd May. Why to choose this date? We wanted to wait for my friend Linda to get back to China, but we wanted to arrange the wedding before the hottest Summer months. Luckily most of my family can also be there for us and it happened to be during a sale period at Finnair so they got nice discount tickets. 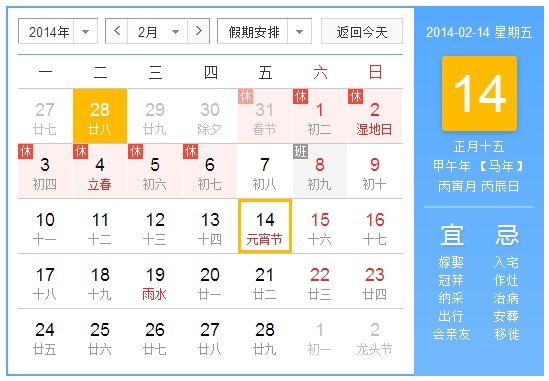 Unfortunately according to the Chinese lunar calendar, you absolutely should avoid (忌) getting married on that day. Because for Chinese the wedding reception is more important than getting the legal papers, my fiancé’s parents aren’t really happy that we chose an inauspicious date for our big day. We, or should I say I, have three months to plan the wedding. This will be our only wedding, we don’t plan to have any second reception in Finland as most of my family can arrive to Guangzhou in May. I want to include both Chinese and Finnish elements to the wedding, but stay true to our vision of the day. More wedding posts will surely be on its way during these months! New passport, new bank account? Yay :) Valintine’s Day for getting your 结婚证! Just perfect! I am one of those rare people who still love Valintine’s Day, even though all my friends and family tell me, it’s just an invented day where shops can make money. Pfff I am an old romantic. Valintine’s day is perfect. So happy for you guys. And you also make sure you to be husband won’t forget it (your Valintine’s flowers are safe hehe). And I think it’s ok to marry on an inauspicious date. After all it’s about love, not the date. And you guys have to bring two culture together. There are always gonna be compromises. My fiance isn’t much of a romantic, but perhaps in time he will learn to be even a little bit :) I like festivals and events that bring a change to the normal everyday life. So Valentine’s Day is a good excuse to have a date night and later on our anniversary. We got married the 3rd of October because that day has a meaning for us. Since we started formally in that very same day. We could not get the restaurant we wanted because it was fully booked, and the only day they had was the 4th, no thank you! Organizing the wedding in China is easy and fast, you will see how 3 months is more than enough time. Last but no least, remember to talk about everything and to explain to your Finnish relatives about it, during the ceremony you probably won’t be able to sit down and eat with them. We will have a small wedding with people between 30-50 and I will surely find the time to sit with my family as well. Luckily we have friends who speak both Cantonese and English who can help out with translating. Congrats! As long as both of you feel comfortable with the dates, than they should be alright. So long as the dates don’t fall on the 4th, because that’s a sure no-no for the Chinese! Thank you! My future mother-in-law now understands how important it is for me to have my family there when we have the wedding party. It’s not ideal, but she understands. There might be even some family members attending from her side. She is a very amazing woman always trying to compromise in cultural differences. I like your Valentine’s Day choice – it also happens to be 元宵节 this year, making it doubly easy to remember. We had a very tight timeframe to work with for our wedding reception, trying to find a good date within the two-week window my parents would be in China. But we succeeded. It would seem you have an equally tight timeframe for your planning – I don’t know the Finnish summer, but Norway was not hot when I was there (sorry, closest comparison I can make), and I remember summer coming much earlier and being much more fiercely hotter and more humid in Changsha when I lived down there. And, of course, airfares are not cheap, so picking a time when your family can save on the travel expenses is definitely a bonus. I’m wondering if my fiance could agree on two anniversaries per year later on, one on Valentine’s Day and one on 元宵节 as they usually aren’t on the same day. Luckily my fiance’s mother have come to understand that having the wedding in May 2nd is very important for me as I have my family there with me. Because of some unfortunate event in our family, only a small part of my fiance’s relatives will attend, but I’m happy to see at least a part of his family there on our big day. What’s wrong with 3rd May, which is Saturday? :P If 2nd May is an unlucky day, then why don’t you postpone your wedding by 1 day? We already discussed this, but for others to know: We wanted our friends to have a holiday the next day as well so they could stay longer at our wedding party :) And the 3rd isn’t lucky either. When we had our state wedding we cared about the date very much but the year later when we had our little Chinese wedding and our wedding in Finland we just tried to get some date where was still free time. Ours will be Valentine’s Day if everything goes well and we get the papers done that day. Easy to remember as well and this year is special when both western and Chinese Valentine’s Days falls into the same date. Sara! Olen kytännyt sun suomen kielistä blogia, jossa ei ole tapahtunut hetkeen mitään. Olin ihan unohtanut, että kirjoitat myös englanniksi. Ja kun tulen tänne: bäng! Olet menossa naimisiin, ihanaa! Onnittelut!! :) Mahtavaa! Mukava kuulla, etta siita on ollut viela hyotya :) Taytyykin pitaa se siis viela arkistoituna netissa. Sara, 恭喜啦! Paljon onnea! I haven’t visited your blog for a while, there are already so many happy news. There really seem to be many differences in the wedding customs inside China. Very interesting to hear how your wedding went both in China and in Finland. Right now it looks like that we will have a more traditional Chinese celebration before noon and at lunch, but the rest of the day will be along Western customs. I will write more about things while I plan it. I actually really like holidays, festivals an anniversaries as it gives you a nice break from the everyday life. I also always remember that Japanese guy who introduced me and my husband :) You must be very thankful for your friend as well. Funny how you manage to combine both cultures. A big inspiration! In May we can see if I did a good job with combining the cultures. Thank you for the comment Candy! I am now catching up with your blog ;) I followed you in Facebook but didn’t find time till now to comment here. I am so glad you took this step, I can feel from your posts how excited you are about this new phase. In our case we didn’t chase our dates as you did. My MIL had no problems as she knew my dad would be coming from far away and is difficult for him to choose his holidays cause his company’s policy is complex. So we focused on a holiday to make sure everyone would be in T’s hometown. And after that we took a number that was good and had no 4 on it. Good to hear everyone was flexible when you chose the date. On our case my in-laws gradually accepted the inauspicious date and all the new things that came when their son married a foreigner. Actually, it is much more complicated with choosing the auspicious date in Chinese culture, as I found out. In order to set our wedding date, my mother-in-law went to see a feng shui master who calculated an auspicious date according to our (my and my husband’s) date of births. It is 2nd Feb. After reading your blog post, I decided to check the lunar calendar, whether 2nd Feb is a good day for getting married. And guess what? The lunar calendar “says” that our auspicious date is not so good for getting married! Things in China are always complicated. Well that is very interesting indeed! I guess the lunar calendar isn’t the know it all I thought it would be. I’m wondering how many people only check the lunar calendar and how many actually go see a feng shui master or another expert on this matter.